Each year, HRE unveils its HR Honor Roll—a group that now includes 30 recipients who have demonstrated excellence and leadership in the field of HR. The 2018 winners represent a range of experiences and have brought unique strengths to their respective organizations; however, they share a common commitment to making HR innovation a driver of company success. Dave Kozel says the company he joined 15 years ago—PVH Corp.—bears little resemblance to the organization it is today. The clothing wholesaler and retailer grew from 7,500 employees in North America to 36,000 associates worldwide by acquiring global lifestyle brands that include Calvin Klein, Warnaco and Tommy Hilfiger. In the early days, Kozel says, PVH’s HR function reflected a decades-old personnel department that focused on administrative transactions. Its HR systems were antiquated, an d employee training was minimal. Even its internal communication strategy was practically null and void. Since then, the HR and communication functions have evolved, reflecting a 21st-century workplace. Under Kozel’s guidance, a results-based HR function was built that values inclusion and diversity and supports a variety of communication tools such as an intranet. Hundreds of training opportunities exist for every employee at every level. HR also conducts employee surveys about staff needs and desired changes. Despite these massive improvements, Kozel says, he never considered himself an “HR person,” but rather he simply focused his energies on helping the company be successful. The catalyst behind most of these HR changes has been employee feedback from the company’s optional, biannual surveys, says Kozel, adding that the global response rate averages 86 percent. The results are disseminated to senior executives, who are mandated to share them with their department or staff and develop a global action plan to address each key issue. One year, for example, employees cited a lack of skills training. So Kozel launched PVH University, which offers hundreds of face-to-face and online employee courses. The curriculum is organized into five academies aligned to support four key initiatives: leadership, inclusion and diversity, professional skills and supply chain. So far, 89 leaders have completed the global-leadership program within the leadership academy, which was designed in conjunction with the Wharton School of the University of Pennsylvania. Since women represent 68 percent of PVH’s workforce, a women’s leadership council was also formed, which rotates its 10 members every two years and actively engages in women’s leadership issues, such as upward mobility. 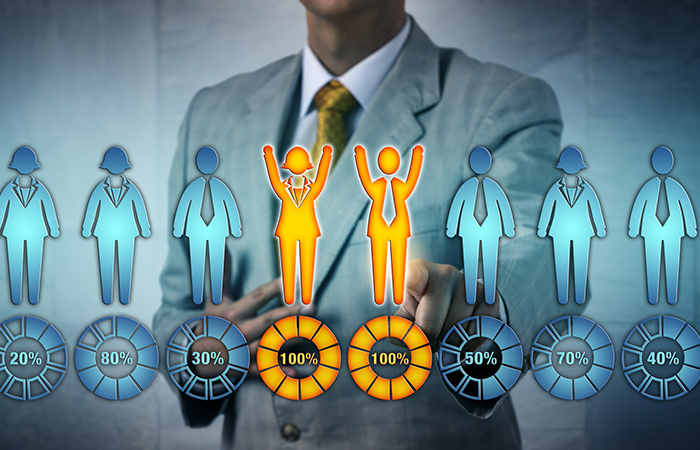 Survey results even influenced the formation of Kozel’s talent acquisition and management team. Five years ago, one of the issues employees raised was poor internal communication. Too important to place on a back burner, Kozel hired Tiffin Jernstedt to address the issue. While Kozel has coached her on the company’s “long game” of building critical employee programs, among Jernstedt’s favorite stories invol ves his commitment to employees, including the 200 associates who lived in Puerto Rico when Hurricane Maria slammed into the island last year. She says Kozel mobilized his HR team and company leaders to fundraise, ending up with $450,000 through employee donations and company-matching funds. PVH then partnered with charitable organization E4E to distribute the emergency funds to these employees, who were still receiving PVH paychecks even though their workplace was destroyed. Due to Kozel and his HR team’s efforts, PVH has grabbed national attention. The list of Kozel’s accomplishments goes on and on, which stems from his rich HR background. He earned a master’s degree in industrial relations from the University of Illinois and previously served as executive vice president of HR for J. Crew Group Inc., vice president of HR at Grey Advertising and Deluxe Electronic Payment Systems, and senior HR director at Citicorp Consumer Credit Services. As an HR leader at PVH, he has encouraged senior leadership to participate in a training session—Confronting Unconscious Bias—and created two employee-retirement plans: a 401(k) and a fully funded, open-pension plan. For Kozel, diversity and inclusion aren’t part of a checklist; they have real meaning. For the past two years, the company has been a platinum-level sponsor for the New York City Pride March, which celebrates the LGBT community. For Gale King, the key to solving the employee-happiness equation ultimately comes down to just two variables. “In the end, people care about whether they feel valued by the organization, and whether they have opportunities to grow with you,” says King, executive vice president and chief HR and chief administrative officer at Nationwide. “No matter who you are, you want to feel proud about what you do, and you want feel that the company is invested in you,” adds King, who oversees the Columbus, Ohio-based insurance provider’s HR, corporate-real-estate, security and aviation functions, with responsibility for roughly $1.1 billion in operating budget and benefits expenses. King, who became Nationwide’s CHRO in 2009, has been instrumental in ensuring that employees are engaged and fulfilling their goals. For instance, she instituted an annual engagement survey (which boasts a 98 percent participation rate), periodic pulse surveys and leader scorecards in an effort to better measure engagement and performance. When King arrived, Nationwide’s engagement scores were in the 49th percentile and now sit in the 74th percentile. Over that same time, the company’s revenue grew from $31 billion to $46.5 billion. King has helped spearhead programs designed to enable Nationwide employees to build their professional networks and find mentors among the company’s leadership. For example, the company’s Touch Points Program was launched to provide top Nationwide talent with connections to the board of directors, CEO and executive-leadership team. At the heart of such initiatives is Nationwide’s, and King’s, desire to intertwine diversity and inclusion with professional development. In 2005, the organization established a formal D&I structure that has grown to include learning initiatives, such as required training on conscious i nclusion and inclusive hiring practices. Since 2009, King has helped expand the number of associate-resource groups to 16 within Nationwide, as well as grow to 18 the number of diversity and inclusion business councils, which are designed to support and promote a diverse and inclusive workplace across the business. King has also been at the forefront of an effort to put more women in leadership roles through development programs, mentoring, sponsorship and transparent job posting. At Nationwide, women currently hold a number of C-level roles, such as chief governance officer, chief compliance officer, chief digital officer and chief technology officer. Overall, women make up 35 percent of the company’s senior-level leader positions. The company recently received the Catalyst Award, which recognizes extraordinary efforts to advance women in business. It has also been a recipient of LATINA Style’s Top 50 award, bestowed annually upon companies that the publication deems as the best places for Latinas to work, and earned a spot on the Human Rights Campaign’s Best Places to Work list for LGBT associates for 13 consecutive years. This award-winning organization, however, was in a transitional phase when King arrived. In 2009, Nationwide brought in a new CEO. King and her HR team helped lead the company’s subsequent organizational redesign, in addition to serving at the helm of its 2014 implementation of an integrated enterprise-business operating model and its “one company” talent and culture strategy. This reformation brought 14 company businesses under one brand, and necessitated restructuring the enterprise as part of the transition. The effort to “more efficiently and effectively go to market under one Nationwide brand required major business partnership and leadership by the entire HR team,” says King. As part of the restructuring effort, the HR team worked closely with business leaders doing the organizational-design work—creating new organization structures, teams and jobs, and was instrumental in helping guide the workforce going through the change. This included one-company culture training, and collaboration, change management and new skills development in order to effectively operate across new businesses, King says. King’s guidance and efforts during this pivotal transition phase are among the indicators of the steady leadership she’s provided since taking the helm of HR at Nationwide nearly a decade ago, says CEO Steve Rasmussen. Kevin Silva recently uncovered a letter his 19-year-old self wrote to his mother, who was worried about his career path. “I will do something meaningful in life,” he wrote. “Maybe one day I will get into personnel.” Years later, his words couldn’t be truer—he currently serves as executive vice president and CHRO of Voya Financial, which, for six years, he has steered through becoming a public company, three organizational-health surveys and plenty of transformational change. In 2012, financial-services company ING U.S. was divesting its U.S. interests, which included retirement, life-insurance and asset-management divisions. Silva partnered with CEO and Chairman Rodney O. Martin, Jr. to examine all possibilities for the company’s future. Once it was decided that the best option would be going public—which it did in 2013, changing its name the following year—Silva was tasked with spearheading a culture makeover. Going public and transforming into Voya gave the organization an opportunity that not many companies get—to start from scratch. To avoid the trap of an aspirational culture—a vision of what a company wants to be, not what it is—Silva says he knew the behaviors of leaders must align with published company values to fuel cohesion and harmony, which wasn’t always easy to achieve. Most employees experience company culture narrowly—through their work environment or their supervisors—so the real challenge was helping them see themselves as part of something bigger, he says. Silva conducted an organizational-health survey with McKinsey in 2012 to gather employee feedback. The results led him to focus on three initiatives, the first of which was the development of a rigorous talent-management agenda. Silva implemented continuous-improvement training for all employees, si mplified the performance-management process so it emphasized feedback and coaching, and focused heavily on succession planning for future leaders. These efforts led to a 95 percent retention rate among high-performing talent in 2017, a growth in female and ethnically diverse hires (56 percent and 48 percent, respectively), and a 23 percent increase in training participation. Silva’s next task was to support Voya’s development of a new business-operating model to increase revenue and reduce expenses, as well as transform areas such as workforce planning and employee-transition management. The third prong of Silva’s strategy was to promote a “One Voya” culture by breaking down silos and building an inclusive environment. He expanded Voya’s diversity and inclusion function, increased participation in corporate-responsibility programs and created a Voya Foundation investment strategy to align charitable investments with values. According to Martin, Voya’s CEO, Silva has been a key member of the executive committee who has helped grow Voya into the company it is today. Silva’s efforts in diversity and inclusion are arguably his most recognizable. Under Silva’s direction, Voya was named to the National Association for Female Executives’ 2018 Top 70 Companies to Work for Executive Women list, received a perfect score on Human Rights Campaign’s 2018 Corporate Equality Index, was named to Fortune’s 2018 “World’s Most Admired Companies” and Dow Jones’ Sustainability Index, and became a certified Great Place to Work. External recognition is laudable, but internal appreciation can help build an engaged and productive workforce. Jen Centrone, senior vice president of HR, retirement and employee benefits, reports to Silva and says she has nothing but respect for his vision of One Voya, particularly his commitment to diversity and inclusion. Voya’s independent board of directors comprises 44 percent women, and women make up half of its executive committee. Silva spearheaded the creation of a Disabilities and Special Needs Employee Resource Group, and serves as its executive sponsor. Voya is backing new federal legislation to support people with special needs and has also worked to ensure its website complies with accessibility guidelines. It is sponsoring the U.S. Business Leadership Network to help people with disabilities obtain meaningful “career-track” jobs. From 2012 to 2015, the company saw a 10-point increase in its score on its organizational-health survey, along with an 88 percent participation rate. It took Kronos Inc. more than 30 years to reach $600 million in revenue, a milestone it hit in 2009. But since David Almeda joined the workforce-management-software company in 2010 as its chief people officer, revenues have more than doubled to over $1.3 billion. It is heady praise such as this that landed Almeda a spot on this year’s HR Honor Roll, but it focuses on just one aspect of his tenure with the company. Indeed, in addition to the rollout of an unlimited PTO program in 2016, a laundry list of new benefits also helped raise engagement scores, including: student-loan-repayment assistance, enhanced maternity leave with a brand new parental-leave program for births and adoptions for both moms and dads, childcare-financial assistance, adoption assistance, an increased 401(k) match for employees with five or more years of tenure, an annual scholarship program for 20 children of Kronos workers and enhanced short-term disability at 100 percent. But it is his team’s creation of a Manager Effectiveness Index—which Ain believes “will help take Kronos to heights we’ve never seen before”—that Almeda seems most proud to talk about. Through performance reviews, leadership-goal ratings, focus groups and the company’s Courage to Lead award nominations—combined with external benchmarking with organizations such as Google, Facebook and Deloitte—Almeda’s team isolated four behaviors the best leaders share: communicating openly and honestly; empowering and enabling; developing and encouraging; and supporting the whole person. Once Kronos’ 700 managers receive their scores, they meet with their own managers to develop a plan to address any shortcomings, followed by a meeting with their team to discuss implementation of that plan. “The MEI gives us another layer of important visibility into what effectiveness really means,” Almeda says. The index has already proven its worth, he adds, pointing to a 3-point increase in engagement scores in the past year alone. Almeda’s own MEI score is 99 percent, as evaluated by his direct reports. Meanwhile, the HR team’s overall engagement score, at 94 percent, is higher than the Kronos global average. But running a highly regarded HR department means dealing with the occasional departure, such as two high performers who were recently lured away with VP roles in HR and talent management. After a recent restructuring, Almeda—who also holds the title of senior vice president—is now one of three people who reports directly to the CEO, adding that he gets between two and three hours of face time with his boss every week. “There are not a lot of CEOs who give you that kind of mission and encouragement,” he says. So which figure is he more proud of: Kronos’ $1.3 billion in revenue or its all-time high employee-engagement score of 87 percent? No one would disagree with that statement more than Almeda’s boss. Find out how industry experts created wellness plans with mental health in mind.